I made up another new chicken dish tonight that I came up with when trying to think of a new sauce for chicken - I'll call it Horseradish Baked Chicken. 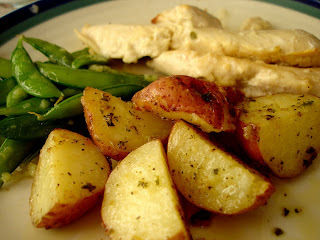 I served it with roasted potatoes and sauteed sugar snap peas. Overall, everything was very good and I would make each dish again. However, the potatoes were a little to sweet to complement the chicken. Next time I'd do spicy potatoes. Melt butter in a pan over medium heat. Add flour and stir. Whisk in milk, bring to a boil, then simmer about 3 minutes. Stir in the horseradish, sour cream, Dijon, and spices. Stir/simmer for a few minutes. Pour about 1/2 of the sauce over chicken in a baking dish (the rest is good heated up and served over your side - rice, plain potatoes, noodles, etc). Bake on 350 for approx 20-25 min til chicken is done. Turn the broiler on for 4-5 minutes to get the sauce nice and bubbly. Toss potatoes with olive oil and spices (and cheese) and put into a flat baking dish. Bake on 350 for approx 30 minutes, or until tender. Be sure to flip your potatoes every few minutes so they get crispy all around. Bring a small pot of water to a boil, add sugar snap peas. In the meantime, heat oil in a pan, add garlic and saute. After 3 minutes, removed sugar snap peas from the water and add to the pan with the oil and garlic. Saute for 2 minutes. Rachel Ray has a similar sauce in one of her cookbooks. I found it because I was looking to use up some leftover horseradish. I don't know if it's exactly the same as your but it sounds familiar. I am forever on the hunt for new sauces to put on chicken. I'll have to look at her recipe - I made mine up! !